The home is completely eco-friendly, so formaldehyde free material was a must-have. The client chose a dark gray laminate in our Moonlight color that met his "green" requirement. Aluminum Omni Track wall tracks with specialized accessories were hung along the walls. Hidden inside the drawers along wall six of the wood shop layout are dust-collecting vacuums. The top drawer faces are false fronts that conceal a large box insert which houses these collection vacuums. 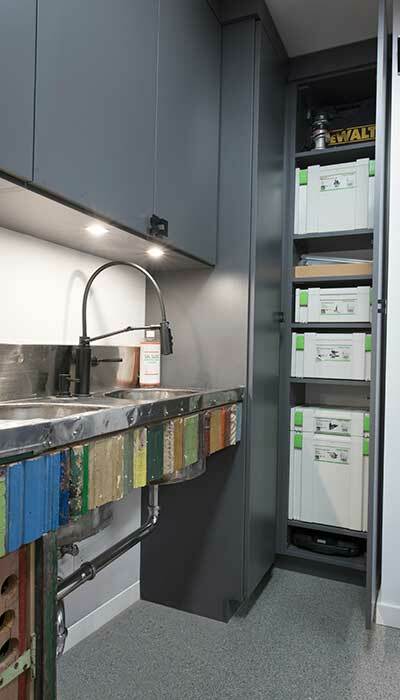 An Omni Track wall system was implemented to hold an array of tools and bins. In order to flawlessly fit the specific height of each table in the basement workshop, laminate panels were configured to specific sizes and cut from the bottom. The butcher block countertops were also customized— each a specific depth. Task lighting was included over the sink and worktable. The basement floors were uneven and sloping, which required careful attention to detail. Wood shop layout includes antique work table in center. This client designs and builds contemporary, one-of-a-kind art quality furniture and desired a home woodworking shop for his craft. 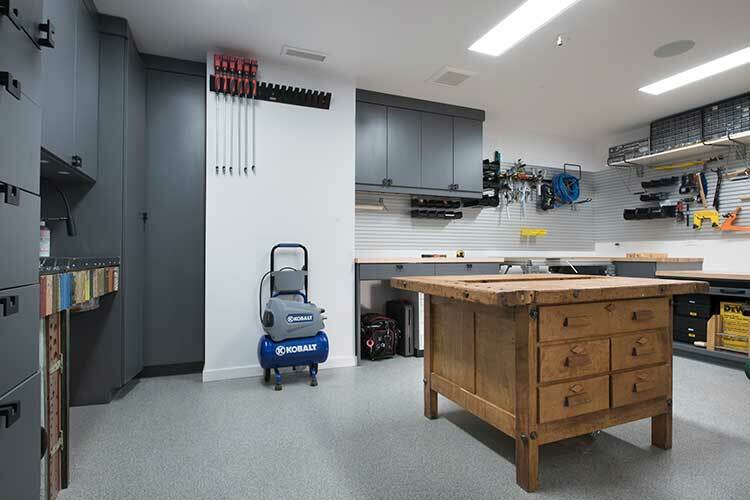 An allotted area in the basement behind a secret, hidden door of the home needed to be transformed into a basement workshop that could make use of every square inch of the limited space. He requested visual height consistency between components for the overall aesthetic as well as functionality. His extensive collection of diverse tools required that each section be precisely sized to meet exacting tool specifications. Heights of the countertops needed to be uniform with a rolling table to move heavy work materials around the room and onto special tops to be worked on in different zones. 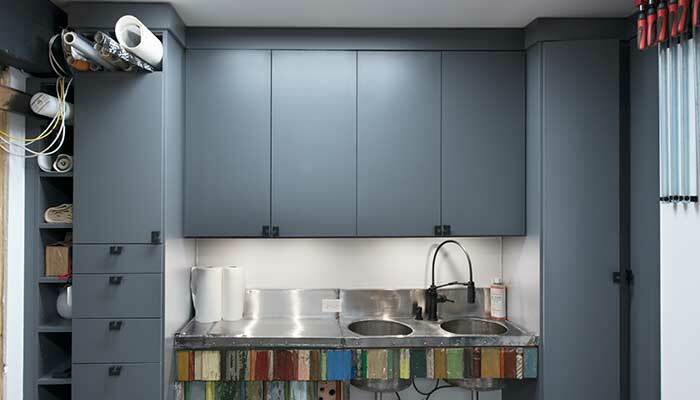 Twenty years prior, the house was actually a commercial warehouse that had subsequently provided reusable (and treasurable) elements — one being a rustic, hand-made sink base the customer had fallen in love with. 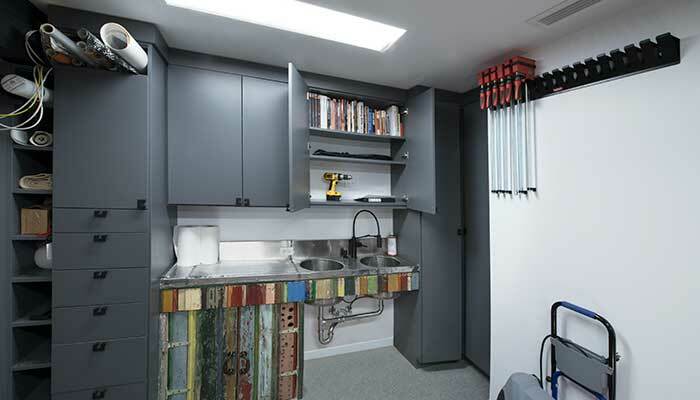 As a way to showcase and repurpose this special piece in his rehabbed home, Closet Works built units around the sink so that it could be showcased, and included cabinets with LED task lighting for the sink and workbench. 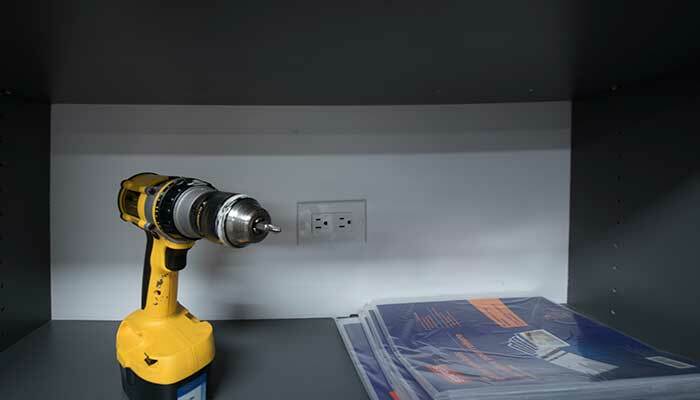 The cabinets also act as charging stations for electric drills and other handheld equipment with outlets centered above the provided shelves. 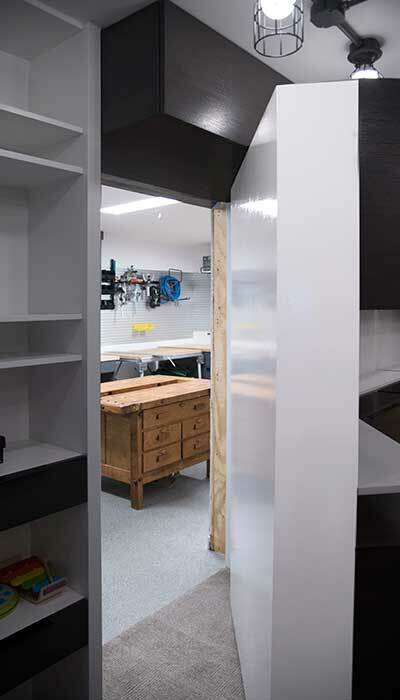 Cubbies were included to safely store blueprints in this home woodworking shop. 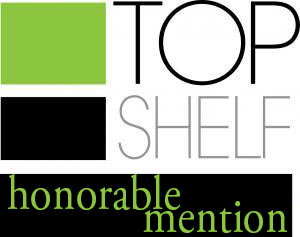 This custom home woodworking shop design won Honorable Mention/2nd Place in the national Top Shelf Design Contest. Wood shop layout includes custom cabinetry to surround antique sink. 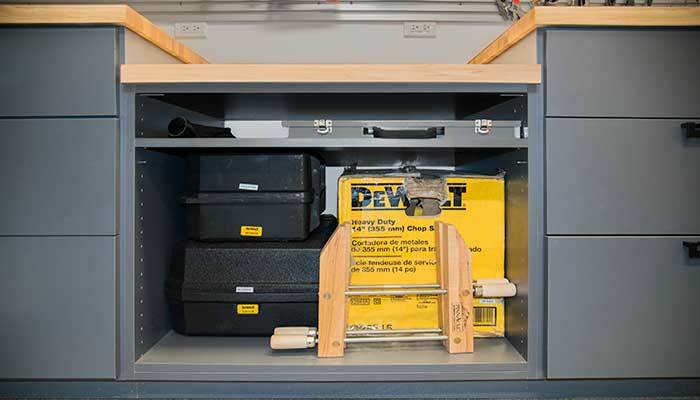 Home woodworking shop includes storage for blueprints. A door disguised as a bookshelf hides this home woodworking shop. 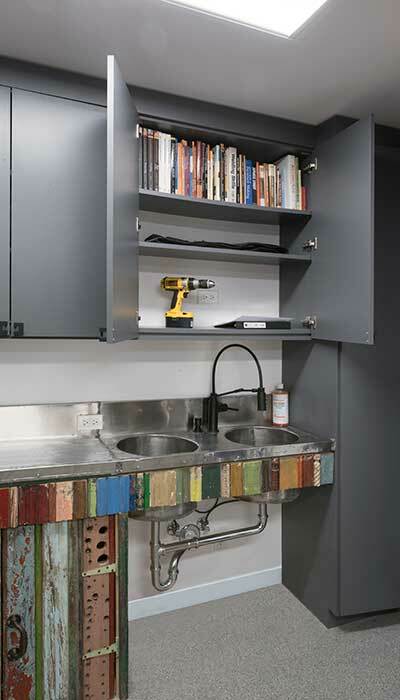 A basement workshop custom sink was designed into the wood shop layout. 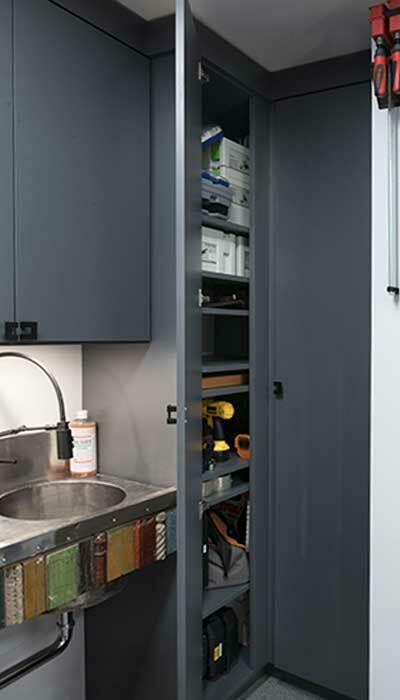 Wood shop layout includes charging stations for hand tools in the cabinets above the sink. 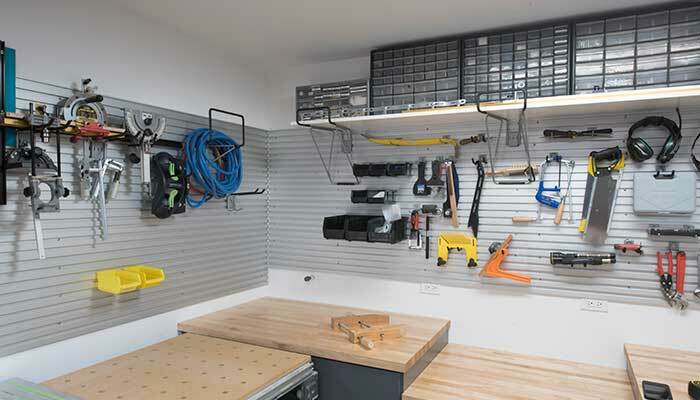 Basement workshop includes Omni Track wall track to organize hand tools. 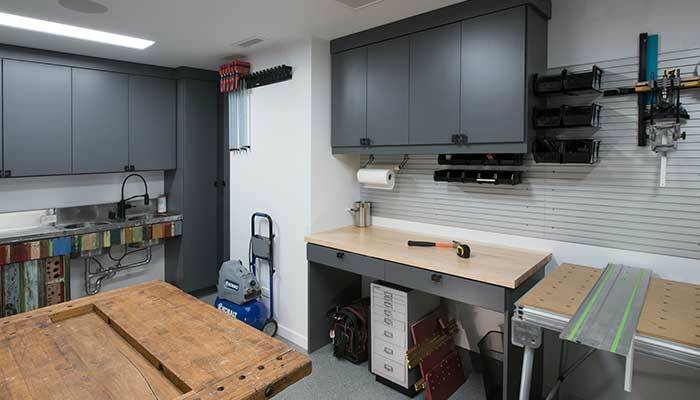 Basement workshop countertops are different heights and depths for different tools. 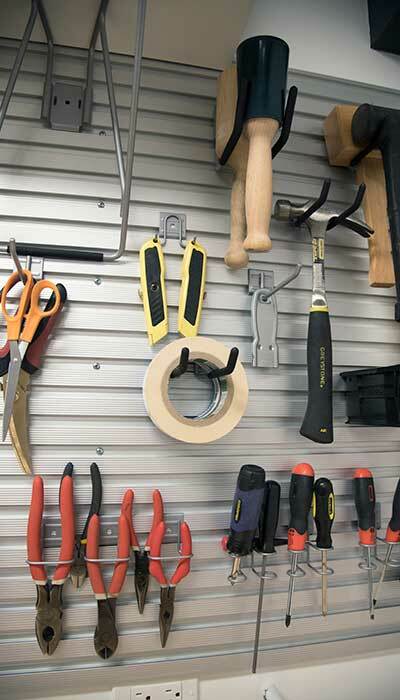 Aluminum wall track organizes small hand tools. Custom corner cabinetry for home woodworking shop. 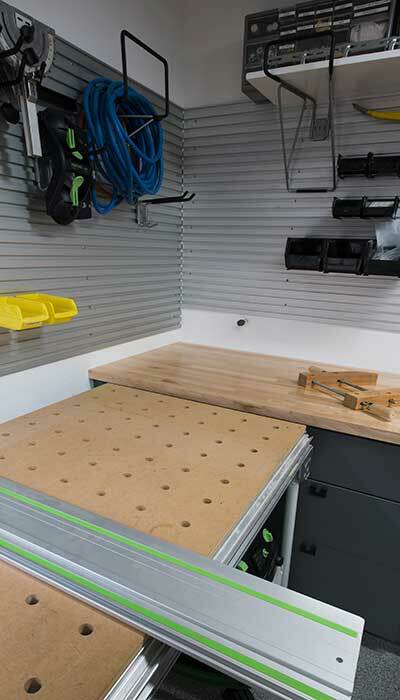 Custom tool bench height for home woodworking shop. This home woodworking shop includes varying countertop heights to suit different woodcraft tools. 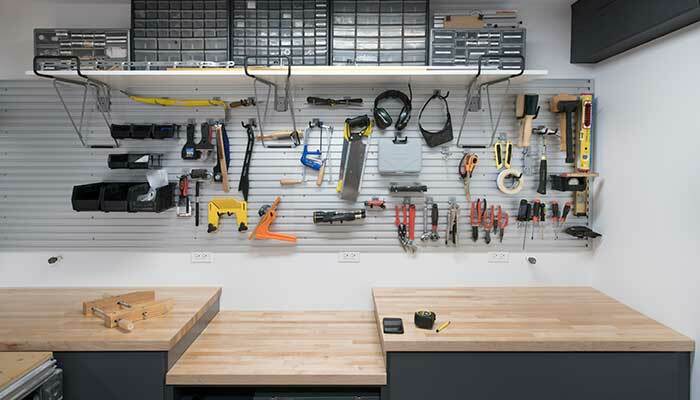 Basement workshop charging station for battery operated hand tools.